Menagerie Mind: iPhone FM Transmitter - That WORKS!! 3) buy one of those crappy FM Transmitters that never work ($). But wait! 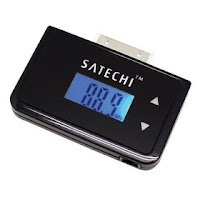 I found this great little FM Transmitter on Amazon (http://www.amazon.com/iPhone-Fm-Transmitter-LCD-Display/dp/B00120GMD6/ref=tag_tdp_sv_edpp_pop_t) and the reviews are awesome in contrast to the other iPhone FM Transmitters on their site, and it's only $30 (that's a 3rd the price of some lesser units)!!! It seemed low risk so I bought it, AND I LOVE IT. Dial your radio to a station that doesn't have a signal, I used 87.7. Plug the FM Transmitter into the iPhone (I have a 3G but this works with my boyfriends 1G also), and change the tuner to 87.7. Pick your music on your iPhone and hit play...and you hear it coming through your car speakers. It's that simple. It doesn't come with written instructions, but it's so easy you don't need any. I have about an hour commute each way, and it only breaks up for a second or two a couple of times the entire commute, around really large overpass intersections when I drive under them. Also, it comes with a charger but it's optional. AND, the really cool thing is that I can use this in the tanning booth too. I just tune the tanning bed radio to 87.7 and hit play on my iPhone and voila, no more listening to the crap everyone else is listening too! My boyfriend has an entirely different route to work and he also has the same performance I've experienced with the same FM transmitter. It's not CD quality mind you, but for $29 I can't complain.